March is Optimism Month. Spring is just around the corner. The days are getting warmer and longer. We are past the January blues and February doldrums, and ready to take on the world! so many things to be optimistic! But what does it mean to be optimistic? Optimism is not just a philosophical viewpoint. Optimism is not irrational cheerfulness, and it’s not blind positivity. By acknowledging obstacles and opportunities, but focusing on the opportunities, optimism enables us to explore the world with open arms and an eye toward solutions, progress, and growth. It also makes life a hell of a lot more fun. Being optimistic doesn’t mean you are naïve or looking at the world through rose coloured glasses. It means you are able to deal with what life sends your way in a positive and healthy way. And being optimistic is good for your health. People who are optimistic tend live longer, and few diseases and health issues. Optimists are more successful and have less stress in their lives. The good news, you can teach yourself to be more optimistic. When you feel a negative thought come one, take a moment and turn it around. Focus on the positive things in your life at that moment – the sun is shining, you have a cup of coffee, a friend texted to say hi. Each time you turn a negative to a positive, you are rewiring your brain to see the good. One of the tag lines of Life is Good is ‘life isn’t easy, life isn’t perfect, life is good’. And that is the key to living an optimistic life – remembering that life is rarely perfect, but there is always something good in our lives. 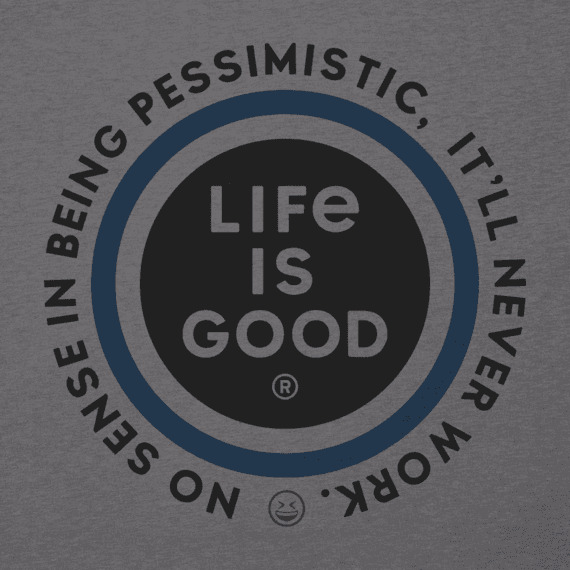 It is this realistic optimism that draws people to the Life is Good product – simple words to remind us to be optimistic and spread good vibes! And remember to always look on the bright side of life!